I bought it for my brother-in-law who smokes brisket it was a great gift. Like the idea that they also included where you can order extra blades. Love this idea. 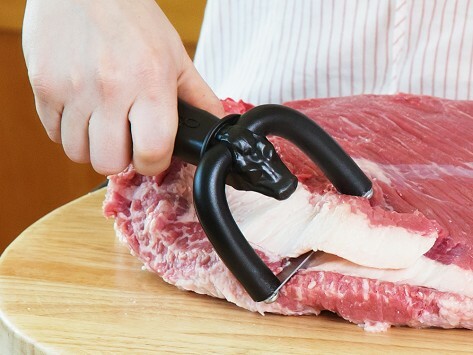 I have crippled hands and it was a little difficult to hold on to & apply pressure to cut into the fat, especially when it gets greasy with a corn beef roast fat. Otherwise, I like it. I would certainly recommend it! I love making brisket for my family on holidays. I hate cutting the fat off. When I saw this trimmer I jumped for joy! I just used it today. The blade is very sharp and I have 3 band aids to prove it. I wish there would have been some directions with it, but I figured it out. Thank-you for finding this. Many of my friends will be lining up to buy it. I bought 2 of these as gifts. Great product, works well, but user must be super careful handling the device. Of the 2, one came w a clear plastic safety guard on the blade, but the other was missing the safety guard. The safety guard is not long enough to cover the entire length of blade. There is exposed 1/4 - 1/2 in. razor sharp area on the sides where blade attaches to handle. I made a safety cover out of a foam 'can koozie' for both of the ones i purchased. Product needs a better safety guard. I have not used it yet. Looks good and sturdy and I will get to use it beforetoo long. I bought this for my husband for christmas and we used it for the first time today for silver skin on a venison roast. It did not work well. I can see where is might work well on thicker pieces of fat and on partially frozen meat but on the this roast, it had alot of drag and didn't trim well at all. We will stick with the havelon knife for that purpose. I will be anxious to try this product when the guys are butchering deer during hunting season. THE TRIMMER WORKS GREAT BUT THE SHIPPING WAS TEARABLE! IT TOOK ALMOST A MONTH TO GET IT. Sharp, sturdy piece of equipment, but I found that using my boning knife does the job quicker and more efficiently. Only used this one time on a pork tenderloin didn’t work that good. Need to try on a larger cut of meat.